An Intimate Heartwarming Tribute ti the King! "A Collectors' Edition You'll Treasure Forever!" "Secret! Private! Hidden 'Til Now!" - 25 Never-Before-Seen Color Photos! Does NOT include the 2 posters as mentioned on the cover. 05---Top Stars Share Their Memories! 10---Dee Presley Tells of Life at Graceland - "I Never Felt Like a Stepmother"
20---Close Friend Jimmy Velvet Admits: "I'll Never Forget Him!" 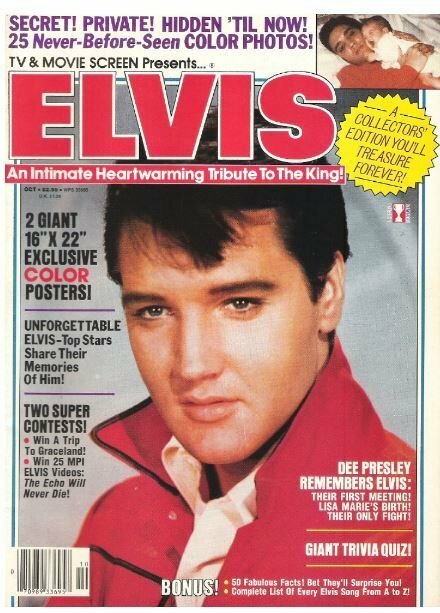 26---Newhart's Bill Sanderson (Larry) - "He Was Someone to Look Up To"
ELVIS - AS YOU NEVER KNEW HIM! 15---50 Fabulous Facts! Bet They'll Surprise You! 32---Super Quiz - How Well Do You Know Him? 25---Win a Trip to Elvis' Memphis Home! 61---Elvis From A to Z! - A Complete List of Every Song He Made!